If you are a homeowner, you must probably know the pain of having to deal with different repair jobs in your home. Repairs can be a bit troublesome, especially if you do not have enough knowledge and tools to do the task. Even if you have the tools and technical ability, it might still be a problem if you have many things to do in your hands. In moments like this, you should hire a handyman repair in Overland Park, KS service. Professional People – Our handyman repair in Overland Park, KS service is performed by professional people. They are courteous and meticulous. If you hire one, you will be assured that your money is not being wasted because they do not waste time in doing their job. Being the professional that they are, you are guaranteed that the result of the repair will be satisfying for you. Quality Service – Our team of professionals know the value of quality service. We value your needs. That’s why our Overland Park, KS handyman repair services are being done with utmost care to ensure that the result will satisfy your requirements. 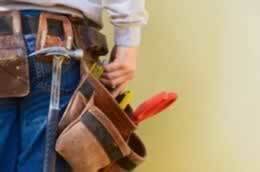 Many Services – Our handyman repair in Overland Park, KS services cover all minor and major types of repair needs in your home. We can repair your plumbing system, broken furniture pieces, drywall, ceiling, and many more. We can also replace your roofing, walls, sidings, flooring, and pavements. Name your repair needs, we got it covered for you!